I made this review very short review so you can read it quickly! 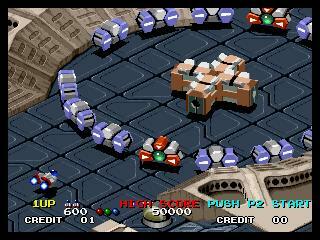 Viewpoint updates the arcade classic Zaxxon (which I played on the Commodore 64). It has a very good "camera angle" making giving it 2d-3d look and it has more bullets than under your underwear! [I have no idea either... Ed.]. I really, really like this game. 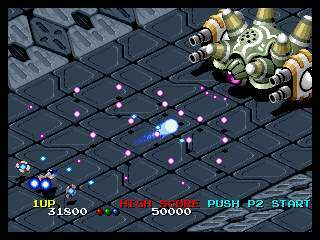 All graphics are excellent in this game (considering it was made in 1992): The enemy sprites are well animated, stunning backgrounds and huge bosses. The game has only a bit slowdown, but not much. There are times were hundreds of sprites fill the screen screen which, since this is a shooter, is a good thing. If I had to give it a number, I'd give graphics a 9 -since it's 9 year old (at the time of writing). Amazing. All the music is well composed and arranged. Sometimes I put the game on pause just to listen to it. They're very catchy tunes and they are perfect for the game. Definitely one of the all time best Neo soundtracks. Compared the music, the sound effects aren't as amazing, but they still work well. Still, the music makes enough of an impact that I can give it a 10. Hmmm... Its hard, very hard! So if you like to play for an easy win, find another shooter. The first two levels are quite easy, but the next ones... I can only get to the middle of level 3 without a continue; and the later stages are incredibly hard (it's like the whole game is cranked to level-4 MVS). But it is fair: If you die in this game, it is your fault. If you have the right skills, you can make it (I don't have those kind of skills...yet.). The ship itself handles perfectly and is loaded with 3 bombs (but use them only when necessary; you will need them later). I definitely give this game a 10 in playability. I like this game a lot, but maybe not everyone will agree with me. noise320ia is a native of Finland. Bobak! is somewhere in America.